Moisturize, and Maintain Radiant-Looking Skin! Created specifically for salons, the Hydration Station ™ combines cutting edge technology with time-tested natural techniques to blanket the skin with moisture. 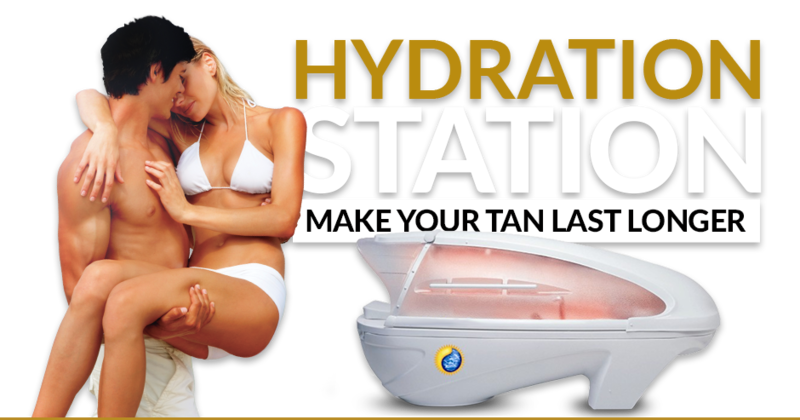 Hydration Station™ is the first system of its kind to offer Tanning salon and Tanspas the ability to pamper our clients with steam moisture. Hydration Station ™ incorporates Hydrofusion™, a proprietary combination of topical radiant heat and steam, LED color technology, and a vibratory bed in an advanced capsule. This powerful combination leaves skin looking soft, supple and radiantly beautiful! Prepare. 2-3 Shades Darker Tan , Prolong. Ideal for Air Brush Tanner, Protect. Full Body Skin Makeover, SLIM & SMOOTH Finally- A Personal Trainer that Pampers. Slim N’ Smooth Body Transformation- DETOX ROCKS! Ideal for the UV tanner! Achieve darker tanning results with all-natural, full body “TingleFactor” phenomenon. Accelerate your accelerator, Improve the tone and texture of your skin, Extend the life of your UV tan, Keep your skin feeling hydrated and “baby soft”. Mineral Melanin Concentrate – A tropical boost with coconut and tangerine. Perfect for the tanner who loves a good bronzer. Achieve a more even and natural sunless application. Extend the life of your sunless tan days longer! Improve DHA, vitamin, and nutrient penetration. Promote an even skin tone and radiant glow. Aloe Concentrate – A soothing blend of cooling aloe, cucumber and melon. Contains: Aloe Vera, Copper, Algae Extract, and a Blend of Aromatic Essential Oils. Specifically formulated for Prolong program. Ideal for ultimate skin rejuvenation! Full body vitamin boost! Deeply hydrate and revive skin. Minimize the signs of aging. Improve texture and tonality of your skin. Extend the life of your tan. E and C Concentrate – An energizing blend of oils derived from vitamin-rich citrus fruit. Hydration Station has answered your call. Finally an all-natural way to achieve the physique you have dreamed of while indulging in the ultimate personal, pampering experience. Relax and unwind as Hydration Station energizes your body and your senses. Contains: CoQ10, Hylauronic Acid, Aloe Vera,Vitamins A, E and C, Plant Collagen and Elastin, Green Tea Extract, and more. Specifically formulated for the Slim & Smooth session. See the Change. Be the Change. Consistently receive a minimum of 3 Hydration Station sessions per week for 4 weeks and assess your results. Choose to continue your active protocol or move to a maintenance protocol of 4 treatments per month.